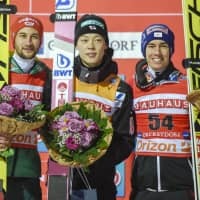 OBERSTDORF, GERMANY - Ski jumper Ryoyu Kobayashi won the flying hill event held in the German resort of Oberstdorf Saturday for his 10th victory of the World Cup season. Kobayashi, who scored 427.0 points with jumps of 224 and 234 meters on the 235-meter hill, extended his lead in the overall rankings while also becoming the 10th ski jumper in history to win 10 World Cups in a single season. “I’m not bad at flying (hills) but I’m not good either, so I didn’t expect to win,” Kobayashi said of the discipline which takes place on larger hills, thus allowing for longer jumps. Ski flying, which is not an Olympic event, also has a different scoring system, which emphasizes distance over technique. “I performed well today. It was good that I got a new pair of shoes that are hard. I got lucky with the wind too,” he said. Germany’s Markus Eisenbichler took second, 0.5 point behind Kobayashi, and Austria’s Stefan Kraft was third. Noriaki Kasai, who placed 21st in Germany, holds the Japanese men’s record for individual World Cup wins with 17. Kazuyoshi Funaki is second with 15, followed by Kobayashi, who went one better than Masahiko Harada to take sole possession of third. 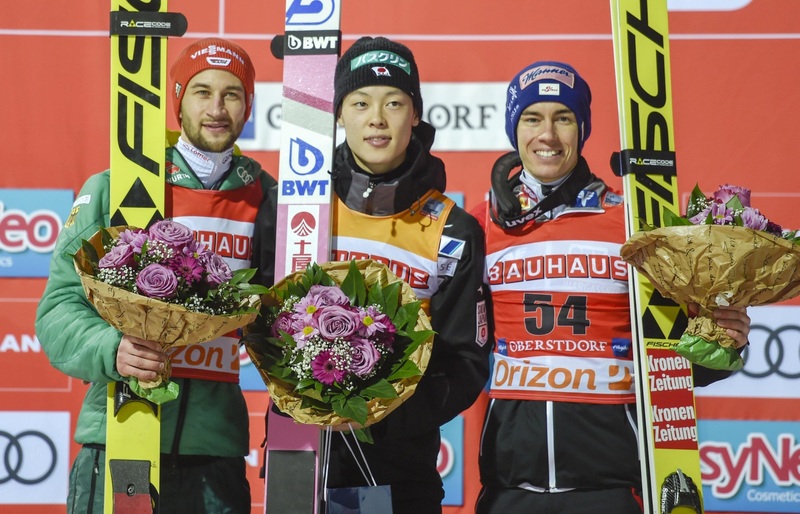 The victory was the first in six competitions for the 22-year-old Kobayashi, who last topped the podium in Val di Fiemme, Italy on Jan. 12. Kobayashi now leads the overall World Cup points race with 1,351, followed by Kraft who has 881.